[XPB-BE500-X] Mills® Baked Enamel Partitions are Floor Mount installation and are the least expensive choice. Floor mount enamel partitions are enginereed of galvannealed steel which is cleaned and finished with electrostatic high grade electrostatic synthetic enamel and oven baked for a mar-resistant finish. Permaseal panels are stronger than conventional crown molding construction. 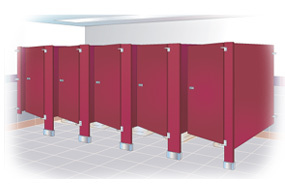 Enamel partitions are available in 21 Color Choices. Types of Layouts: Between Wall (featured) between two (2) walls [features One 60" X 36" compartment and two (2) standard 36" X 36" compartments]. Open End - compartments that will be affixed to only one wall [features One 60" X 36" compartment and two (2) standard 36" X 36" compartments]. Free Standing compartments that will affix to lateral walls [features two (2) standard 36" X 36" and one 48" X 36" compartments]. Alcove is a specific layout [features a single 72" X 36" compartment that attaches to two walls or one wall and the end of a run of comparments. In-Corner Alcove [features is a single 72" X 36" Corner and End Panel compartments]. Also available in Stainless Steel, Plastic Laminate , Solid Core Phenolic, or Bradmore Solid Plastic sold separately. Also available in Sentinel [Has overhead wall mount Bracing - Requires no special floor or ceiling construction], Ceiling to Floor bracing), Ceiling Hung (ceiling brace only). Floor Mounted Overhead Braced Partitions are available in our QUICK SHIP program in specific formats and colors. For information see Quick Ship Partitions. We are here to make it easy for you! For shipping quotes, orders or questions please call our Customer Service Center at 1-877-483-9270.